I was contemplating if I should get the Botanical Pore BB cream or this one. I chose the latter, this is my first BB cream from Nature Republic and I've decided to get the most affordable - Nature Republic By Flower BB Cream from the bunch. Nature Republic By Flower BB cream is not runny but it spreads easily on the skin. The flower scent is therapeutic for me, I love sniffing it while I do my makeup teehee. There is only one shade available when I bought this bb cream. Sadly this is grayish not yellow toned unlike my old favorite Purederm BB cream. But its no biggie because it blends in with my skintone in just a minute. It offers me light to medium coverage and only a pea size is needed to cover up the face. The coverage however is not really buildable. No matter how much product I use it won't cover up dark spots so I use my Etude House concealer. Just like other bb creams I have used it blurs out pores and it brightens skin. It gives me a semi matte finish which is good if you prefer not to apply powder to make it look more natural. I am not expecting much because its cheap but I am amazed that it can withstand hot and humid environment. I tried wearing this bb cream during our dance practice and it was still there after 4 hours! What kind of sorcery is this? It's really nice. Can be used with loose powder on top, it doesn't cake on me. Use when its hot and humid. You won't be sorry. 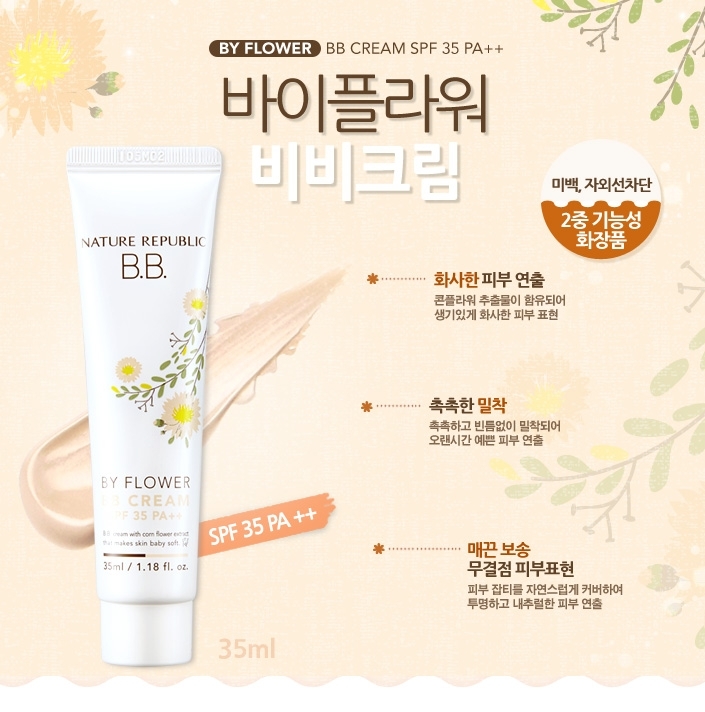 Nature Republic By Flower BB cream is a really good bb cream. This one is a keeper, not just skin friendly but also wallet friendly.